Dust off that barbecue and get grilling -- spring is here! 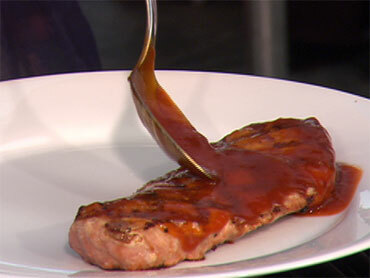 On "The Early Show" Friday, "Big Lou" Elrose, executive pit master at New York City's Wildwood BBQ, shared his mouthwatering recipe for spice rubbed pork steaks with apple bourbon barbecue sauce and grilled green beans. Combine all ingredients for the all purpose rub. Set aside. Light grill to med-med high. Rub pork steaks with the all purpose rub then grill to an internal temperature of 160°F, about 8-10min. Just before removing from grill, brush with the Bourbon Apple BBQ sauce (recipe below). Allow to rest a few minutes, then slice and serve. Serve with additional BBQ sauce on the side. Melt butter and cook onions for 6-7 minutes over medium heat then add the grated apple, cumin, cinnamon, cayenne pepper and bourbon. In a separate pot heat the ketchup, apple cider vinegar, Dr. Pepper, brown sugar, syrup, molasses, Worcestershire sauce, and simmer for about 3-4 minutes. Combine with the apple bourbon mixture and enjoy! Over a medium high grill or stove top, heat the oil and butter in a large sauté pan. Add the garlic and toast just until it begins to brown. Add the green beans and toss to goat with the butter and garlic. Cook until the beans have warmed through about 4-5 minutes. Season with salt and pepper to taste and serve immediately.